Spring, Laurence. 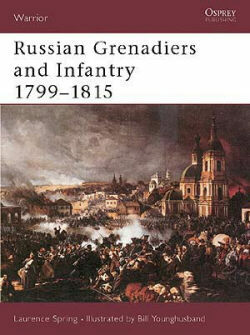 Russian Grenadiers and Infantry: 1799-1815. (Warrior Series: No. 51.) Illustrated by Bill Younghusband. Oxford, UK: Osprey, 2002. 64 pages. ISBN# 1841763802. Soft cover. $16.95. This new title from Osprey covers the Russian grenadiers and infantry during the fascinating period of the Revolutionary and Napoleonic Wars. Its author, Lawrence Spring holds a degree from London University and directs the Russian Army Study Group. The volume starts with an introduction and brief chronology of events between 1799 and 1815 and is then organized along various aspects of army life. The first fragment deals with conscription and provides very interesting details on the organization and process of Russian grenadiers and infantry as well as on levy statistics. The subsequent segments on recruit training, drill, discipline, punishment, pay and provisions are brief, but still provide enough information to satisfy the reader’s interest. Spring successfully intertwines various recollections and memoirs to illustrate his points and highlight points of interest. In a separate section, the author concentrates on the appearance of the Russian infantry and grenadiers and has segments on uniforms, equipment and arms that contain considerable details on each topic, although more information on arms would have been appreciated. Mr. Spring also concentrates on the daily life in the Russian army. He highlights the abuses the troops suffered from their leaders and describes occasions when officers hired their soldiers out to private individuals and kept their earnings. However, he also indicates that "private soldier benefited from this work; it not only cut down on boredom, but any money was divided between the men involved and [soldiers]." Segments on sickness, desertion, motivation and morale provide very brief information. Thus, author discusses desertion in twelve lines, of which six are part of a quote from C. Masson, whose Secret Memoirs is not very reliable source. The first sentence of the quote claims, "Before the reign of Paul I desertion was almost unknown." The remaining six lines of the segment concentrate on the Persian army recruiting Russian deserters. Naturally, reader might wonder about Russian deserters during the campaigns in Italy, Moravia, Poland or Finland. While describing motivation and morale, author concentrates on the period between 1811 and 1812 but fails to review Russian morale during earlier or subsequent campaigns. At the same time, to support his thesis, author cites numbers for the Smolensk Infantry Regiment, who numbered 852 men in October 1812, of whom 247 were opolchenye troops, 413 recruits and 192 veterans. While these numbers illustrate inexperience of this unit, they fail to demonstrate that these recruits and militias lacked in spirit or motivation. Also, author mostly discusses rank-and-file experience in the army and has very few details on officers of the infantry and grenadier units. The most interesting part of the book is on the Russian tactics. Mr. Spring ably describes organization of infantry units, their formations in battle, skirmishing and firing. Diagrams are inserted throughout the narrative to facilitate reader’s understanding. The author describes Russian soldiers as "stubborn in defence and aggressive in attack" but also emphasizes their negative aspects, including excessive alcohol consumption and lack of initiative. The volume is fascinating for numerous quotes from various memoirs that author used throughout his narrative. It is well illustrated with some 40 black-and-white pictures, each well annotated. In addition, there are four pages of color plates by Bill Younghusband. Glossary of terms at the end of the book is also very helpful for readers unfamiliar with Russian language. On critical note, there are a few mistakes in dates and names. In chronology, date for the Battle of Trebbia is given in Julian calendar. Some names are misspelled or given in conjugation, i.e. Echmiadzinom, Izmailom, Rassevaton, Batinye, Giurgevo, Kuroi, Varnoi instead of Echmiadzin, Izmail, Rassevat, Batin, Giurgiu, Kura, Varna. Names of few Russian officers are also incorrectly spelled, Suvarrov (Suvorov), Pauluchoi (Paulucci) and etc. In some instances, same name is spelled differently, i.e. Karyangin and Karyagin. A few events are described inaccurately. During the Battle of Heilsberg, Russians repulsed the French attacks on their fortified camp. Treaty of Bucharest between Russia and Turkey was signed on 26 May, not 22 June. Describing battles of Eylau and Borodino, author refers to the former as a "draw but Napoleon claims victory" while on the latter he simply states "inconclusive," although it was a French victory. Treaty of Breslavl between Russia and Prussia was concluded on 17 March 1813, while on the 19th two sides agreed on the administration of the liberated territories in the Confederation of Rhine and Northern Germany. In final analysis, Russian Grenadier and Infantry is a useful and informative introduction to the Russian army of the Napoleonic Wars and its concise and analytical narrative will certainly incite readers for further research. Russian Grenadier and Infantry is available in bookstores everywhere, through Classic Motorbooks at (800) 826-6600 or at their website: MBI Publishing.